Magnum front man is back with his new studio album, Spirit of Man. This is the follow up to the smash success When Empires Burn. Considered by many to be his career work, Catley set the bar very high with When Empires Burn. Consider me amongst those who hail When Empires Burn as Catley's finest hour. Whenever I am so impressed with a particular album, it's very easy to get let down by the follow up album. Even if the said follow up album is a great one in its own rite, it will be judged against its predecessor, and seen as inferior. For example, Judas Priest will seemingly forever live in the shadow of Painkiller in the eyes of many. Helloween will seemingly never escape comparison to Keepers I & II. While not to the dramatic of a level, Catley's latest release disappointed me at first, as it does fall short of his previous album. After dozens of listens, I am sure that this album will stand on its own over time as a very fine album. 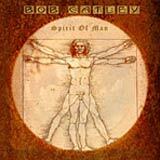 Like I said, Catley had a very tough act to follow, but Spirit of Man holds its own, and will please fans of his solo career, Magnum fans, and also fans of well performed, polished rock such as Ten. Speaking of Ten, Catley has cut ties with songwriter Gary Hughes of Ten for his new solo album. Although Hughes has written songs for the last few Catley solo albums, the transition is barely noticeable. As hard as it may be to grasp, I think Catley's voice is getting better with age. Although the man is in his 50's, his deep, passionate voice is one of the best in the business. Although Catley doesn't write his own songs, he is very much involved in fine tuning them. Despite that, his performance on this album indicates that he is very impassioned about each song on this album. The first seven tracks of this album strike me just hard as the entire When Empires Burn album, although they aren't quite as over the top. You could easily pick any one of the first seven cuts from this album and call it a killer track. Pompous hard rock anthems backed by lush keyboards pave the way. Catley sings his heart out, while catchy melodies and upbeat guitars ensure that the songs instantly stick with you. Moment of Truth, with its swirling keyboards and awesome chorus line combined with the bombastic, ultra catchy Blinded By A Lie are the two absolute knock out punches of the bunch. Last Snow of Winter is the first ballad of the album, and Catley's vocal mastery dominates the song. Additionally, clever keyboard textures and a strong sense of melody ensure that this ballad show avoid the "skip" button that I usually hit when ballads come on. The intense passion and quality of songwriting are just too good to ignore. Moving on then, Judgement Day sees the album take a sudden shift. Unlike the preceding tracks, the song relies very heavily on dark, moody acoustic guitars. Catley's deep voice successfully meets the challenge of the tangent that this song takes, and again, a great chorus line within this song is very much in line with the rest of the album. Vince O'Regan comes up with some excellent solos in the middle of this song, as he does throughout the entire album. On that note, Vince's energetic and passionate, yet tasteful style goes very well with the vocals of Catley. From this point on through the end of the album, the sound never really regains the punch that can be heard quite often over the first two-thirds of the album. Lost To The Night and Walk on Water are two very good, straight forward rock tracks. Both feature the trademark catchiness, smart use of keyboards to enhance the melodies, and some great soloing / shredding from O'Regan. Still, neither song really has the punch of something like Blinded By A Lie or Moment of Truth. Furthermore, a glitch in production seems to have occurred on Lost To The Night. I can hear a hiss subtle, but very present hiss during the verses, while Catley's voice sounds thin, and the music rather unpolished. The rest of the album sounds very tight, so I find this song to be a very strange anomaly. Beautiful Mind is a very laid back track that like Last Snow of Winter, really allows Catley to show off the most passionate and emotional qualities of his voice. This track has some symphonic qualities to it, but the lack of energy (especially) or a big hook leaves me a bit empty at this point. Despite some "see-sawing" in terms of quality over the last third of the album, Catley ensures that this album goes out with a bang. End of the Story is an epic track the goes from light, dreamy, keyboard AOR style music to full throttle melodic metal with great shredding in the middle, and then closing out with ominous, dark keyboards at the end. This is just a beautiful example of songwriting here, and it certainly ends the at times lackluster second half of the album with greatness. Although not to the level of When Empires Burn, Bob Catley shows no signs of quitting when it comes to excellent music. Going in to this album, I didn't reasonably expect Bob to outdo his previous work. Still this album blows away the last Magnum album, and contains plenty of good to excellent material, despite some question marks toward the end of the album.